Radio and television broadcasting pioneer. Born to poor Jewish family in Belarus, emigrated in 1900 to New York City, as boy sold newspapers to help support family, at age 15 left school to work full-time when father contracted tuberculosis. Hired at $5.50 a day as office boy at Commercial Cable Company, then joined Marconi Wireless Telegraph Company of America in 1906. Promoted from office boy eventually to commercial manager of company, learned technology of electronic communications at work and by reading in libraries, also served at Marconi stations on ships and on land. In 1911, installed and operated wireless equipment on ship in North Atlantic and in next year led effort to confirm fate of Titanic. Company revenues grew after federal legislation required continuous staffing of commercial shipboard radio stations. Named Marconi's Commercial Manager, including oversight of company's factory in Roselle Park. In 1915 or in 1916, proposed that company develop a "radio music box" for "amateur" market of radio enthusiasts. Remained with company through later purchase by General Electric (which was urged by government to acquire and consolidate independent radio firms to enhance national security) and renaming as Radio Corporation of America, successful broadcast of heavyweight championship match in July 1921 sparked consumer demand for home radios. In 1926, RCA launched National Broadcasting Company, first radio network in America, with Sarnoff named president four years later. In 1929, RCA purchased Victor Talking Machine Co., nation's largest manufacturer of records and phonographs, merging radio-phonograph production at Victor's large manufacturing facility in Camden. In 1932, in settlement of antitrust case, RCA spun off by GE as independent firm headed by Sarnoff. Pioneered development of television, personally hosted first television broadcast April 1939 of dedication of RCA pavilion at New York World's Fair under name of RCA broadcasting division, The National Broadcasting Company (NBC). RCA became leader of manufacturing and marketing sets and NBC became first television network, gradually expanding its stations from initial site in New York and Philadelphia. 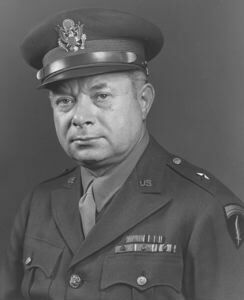 During World War II, served on General Dwight Eisenhower's communications staff in establishing radio network for allied forces in Europe which became Radio Free Europe, at end of war awarded star as Brigadier General which led to becoming called "General Sarnoff." Subsequently advocated expansion of Radio Free Europe and creation of Voice of America to advance US positions during Cold War with Soviet Union. In 1950s, oversaw RCA's development of color television sets and NBC's color broadcasts. Received 27 honorary degrees, including doctoral degrees from Columbia University and New York University. Died at age 80, year after retirement, son Robert succeeded him as RCA chairman. David Sarnoff Library and Museum formerly at Sarnoff Laboratories near Princeton, in 2010 collection of 6,000 artifacts donated to The College of New Jersey while papers, memorabilia and 25,000 photographs given to Hagley Museum and Library in Wilmington, Delaware. Pioneered quick-freezing of vegetables through use of ammonia, began freezing vegetables for General Foods, and in 1943, started selling under own Seabrook Farms brand. In 1911-12, bought out his father, Arthur P. Seabrook, farmer who was first to use overhead irrigation and a gasoline tractor. Expanding on father's property, built two railroads, power, ice and canning plants, six greenhouses and a storage facility. Constructed village of homes and schools adjacent to farm for workers and families. In 1934, workers struck for higher wages, violence provoked national newspaper coverage. Seabrook Farms became one of largest producers of frozen vegetables in world, workers included refugees from foreign persecution as well as Japanese-American internees assigned to work during World War II. Losses due to hurricane in 1954 and conflicts within Seabrook family resulted in sale of company to wholesale grocery firm in 1959. Subsequently, two of Charles F. Seabrook’s grandsons bought back property and revived business under name of Seabrook Brothers and Sons, annually freezes 150 million pounds of vegetables . Born in New Orleans, daughter of Democratic Congressman Hale Boggs, serving as House majority leader in 1972 when passenger on plane that disappeared on visit to Alaska, mother Lindy Claiborne Boggs succeeded late husband in House, held seat for another 20 years. Mother's family, the Claibornes, settlers in colonial Jamestown in Virginia, descendants include more members of Congress than any other American family. Sister of media analyst and commentator Cokie Roberts and prominent lawyer-lobbyist Thomas Boggs. After graduation from Manhattanville College, worked as secretary in White House during Kennedy Administration. In 1964 married Paul Sigmund, professor of Latin American government and politics at Princeton. Taught Latin and government at private Stuart Country Day School in Princeton. In 1974, staff member at Center for the American Woman and Politics at Eagleton Institute at Rutgers University. Elected 1976 to Mercer County Board of Freeholders, board president in 1979 and 1980. One of founders in 1977 of Womanspace, shelter and support program for women and their children subjected to sexual assault and domestic violence. In 1982, candidate for Democratic nomination for US Senate, finished fourth in field of 10 candidates. First woman elected mayor of Princeton in 1983, previously served on Princeton Borough Council, candidate for 1989 Democratic gubernatorial nomination, finished second to James Florio. After death from cancer at age 51, Womanspace began annual Barbara Boggs Sigmund Award honoring those championing causes and issues affecting women and children; Princeton University established Barbara Boggs Sigmund Symposium on Women and Poverty; Princeton municipal government named local park after her. ﻿Prominent Revolutionary lawyer and leader, signer of Declaration of Independence. Following Declaration of Independence, initial vote of New Jersey assembly for first governor of new state resulted in tie between Stockton and William Livingston, with Stockton withdrawing as candidate after being informed of vote and Livingston elected on second ballot. Stockton also rejected appointment as chief justice of state supreme court, continued as delegate to Continental Congress. Member of first graduating class of College of New Jersey (now Princeton University) in 1748 when it was still located in Newark, his father donated money and land for college to relocate to Princeton. Studied law under David Ogden of Newark, became successful lawyer with one of largest practices in colonies, in 1750s built home named Morven on land in Princeton originally acquired by family from William Penn. 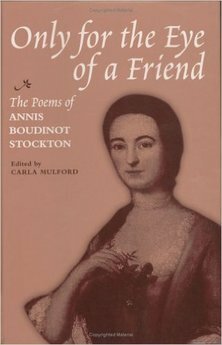 Married Annis Boudinot in 1757, following marriage two of her brothers became apprentices studying law under him, father Elias Boudinot, later signer with Stockton of Declaration of Independence and president 1782-83 of Continental Congress. Also in 1757 traveled to Scotland to successfully recruit John Witherspoon to accept appointment as new president of College of New Jersey. Appointed to royal council of New Jersey in 1765, first argued for colonial representation in Parliament but withheld support for independence. In 1774 appointed a justice of New Jersey supreme court. Eldest daughter Julia married Dr. Benjamin Rush in January 1776, later signed Declaration of Independence as delegate from Pennsylvania and head physician for Washington's army during battles at Princeton, Monmouth, others. Elected 1776 as delegate to Continental Congress with instructions to vote for independence and signed Declaration. In November 1776, Morven seized by British and Stockton captured, imprisoned under harsh treatment by British, released after Congress passed resolution directing George Washington to write letter protesting to General Howe and Stockton allegedly signed loyalty oath to King, then after being freed by British, again jailed by revolutionaries as accused traitor for five weeks, health deteriorated until released on parole. Returned to Morven, which had been occupied by General Cornwallis during Stockton's imprisonment, with destruction or theft of household furnishings, books, crops and livestock. Resumed law practice and taught new students. Two years after release from jail developed cancer, died on February 28, 1781. Stockton University (formerly Richard Stockton College) in Galloway Township named for him. Born as Francis Albert Sinatra in Hoboken, only child of Italian immigrants Natalina Garaventa and Antonino Martino Sinatra. Father a captain with Hoboken Fire Department, also lightweight boxer who fought under name Marty O'Brien. Mother, known as Dolly, a ward leader for local Democratic Party, also ran illegal free abortion services from home, convicted twice. Sinatra expelled from high school without graduating due to poor behavior and attendance. In 1938 arrested on complaint of jilted lover for seduction of married woman, a criminal offense at time, charge later changed to adultery and eventually dismissed. In 1939, married Nancy Barbato in Jersey City, resided in Jersey City apartment house, she gave birth at Jersey City's Margaret Hague Maternity Hospital to children Nancy and Frank Jr.. In 1941, moved with family to small home purchased in Hasbrouck Heights, remained there until relocating to California in 1944. Divorced Nancy in 1951, shortly before his marriage to Ava Gardner, also married third wife Mia Farrow in 1966 and fourth wife Barbara Marx in 1976. Worked as delivery boy at Jersey Observer newspaper, and later as workman at shipyard. Began singing for tips at age eight at local nightclub in Hoboken, began singing professionally as teenager in 1930s, first professional job at Rustic Cabin roadhouse in Englewood Cliffs. Married Nancy Barbato In 1935, mother persuaded local singing group known as The Three Flashes to include him in renamed group Hoboken Four, which won first prize in popular talent show Major Bowes Amateur Hour, including six-month contract to perform on tour across US. In late 1935, began solo career in local clubs, later hired by big bands led by Harry James and Tommy Dorsey. Rumors of links to Mafia sparked by unsubstantiated articles in Hearst newspapers that New Jersey mobster Willie Morretti, Sinatra godfather, coerced Dorsey to let Sinatra out of contract for a few thousand dollars, episode fictionalized in book and movie The Godfather. Highly successful recordings and concerts in 1940s, found ineligible for military service during World War II due to perforated eardrum, but performed for soldiers in overseas USO shows. Began acting career in 1945 movie Anchors Aweigh co-starring with Gene Kelly. Popularity declined in late 1940s and early 1950s, but won Academy Award for Best Supporting Actor in 1953 movie From Here to Eternity, with his casting again bringing reports of pressure from mobsters. Performance marked turnaround in both acting and singing career, followed by series of starring roles and best-selling recordings. Initially politically active as Democrat, became close to John Kennedy through JFK brother-in-law Peter Lawford, introduced Kennedy to mistress Judith Exner, but excluded from Kennedy circle after Exner revealed as also having relations with Chicago mob boss Sam Giancana. Subsequently supported Republican campaigns of Richard Nixon in 1968 and close friend Ronald Reagan in 1980 and 1984, returned to Hoboken to campaign with Reagan in 1984. Maintained long friendship with Paul "Skinny" D'Amato, "Mr. Atlantic City" who owned The 500 Club, supper club and illegal casino and continued to book Sinatra during low point of career, with Sinatra retuning after comeback and Atlantic City decline to perform regularly at Club without fee, flew from California to be pallbearer at D'Amato funeral in 1984. Also represented by agent and manager David "Sonny" Werblin of Music Corporation of America, Rutgers graduate and later president of New York Jets and first chairman of New Jersey Sports and Exposition Authority. In 1970, lost appeal of attempt to quash subpoena issued by New Jersey Commission on Investigation for him to testify on organized crime associations, with US Supreme Court ruling against him in 4-3 decision in Sinatra v. New Jersey Commission on Investigation, subsequently appeared before Commission in session closed to public and press. Announced retirement in 1971, but returned in few years to continue performing into 1990s, including 75th birthday concert in Meadowlands in December 1990. Awarded honorary degree 1985 from Stevens Institute of Technology; Hoboken post office, park and road named in his honor. Died at age 82 in Los Angeles. Revolutionary era patriot and poet, wife of Richard Stockton, signer of Declaration of Independence. Popular hostess at Princeton estate of Morven, entertained George Washington, other Revolutionary leaders, carried on extensive correspondence with Washington during and after War. Daughter of Elias Boudinot, who with her husband a signer of Declaration of Independence and later president 1782-83 of Continental Congress. Brother studied law under Richard Stockton and married his sister, Hannah Stockton. Born in Philadelphia in family home next to that of Benjamin Franklin, attended school established by Franklin. Began writing poetry at early age, refrained from publishing over concern of whether appropriate for women, but circulated poems privately through correspondence to Washington and others, with some reproduced in newspapers and becoming popular recitations, including one sung by women of Trenton honoring George Washington on his travel through town on way to inauguration in New York City. (In 1985, one of her direct descendants donated manuscript of poetry to New Jersey Historical Society which was subsequently published). Married prominent lawyer Richard Stockton in 1757, whose wealthy family had acquired lands in Princeton from William Penn, also donated land and money to help College of New Jersey (later Princeton University) relocate from Newark to Princeton. Eldest daughter Julia married Dr. Benjamin Rush in January 1776, who later signed Declaration of Independence as delegate from Pennsylvania and served as head physician for Washington's army during battles at Princeton, Monmouth, others. Later in 1776, as British army under Lord Cornwallis approached Princeton, she collected important state papers and records of American Whig Society, later named honorary member and only woman of Society. Evacuated Morven in November 1776 with children for refuge in Monmouth County, but husband soon captured and imprisoned by British. After learning of husband's harsh treatment, she petitioned Congress, which passed resolution asking Washington to contact British General Howe, who ordered release. Husband then accused of disloyalty for alleged signing of loyalty oath to King while imprisoned, jailed by revolutionaries for five weeks until freed. Morven estate left pillaged by British troops, with furniture and books burned and livestock released. Although husband's health deteriorated during incarceration, resumed law practice in attempt to restore finances until death in 1781. Survived husband by 20 years, died in Princeton and buried in Princeton Cemetery. United States Navy commodore, honored for role in capture of California during Mexican–American War, also US Senator and head of Joint Companies railroad and canal company. Grandson of Richard Stockton, signer of Declaration of Independence, and son of Richard Stockton, a US Senator. Born at Morven, Stockton family home in Princeton. At 16, enrolled in US Naval Academy as midshipman, served at sea and ashore during War of 1812. Later assigned to ships operating in Mediterranean, Caribbean and off coast of West Africa, first naval officer to act against slave trade, capturing several slave ships and negotiated treaty leading to founding of nation of Liberia as haven for freed slaves. Returned to New Jersey in 1820s, managed business affairs in state relating to family real estate, canal and railroad interests, also ownership of gold mine in Virginia. In 1838, returned to active naval service as captain, advocated modernization of Navy to become steam-powered, declined appointment in 1841 by President John Tyler as Secretary of the Navy, but successfully requested support for construction of advanced steam warship with a battery of heavy guns. At his request, ship named USS Princeton, Navy's first screw-propelled steamer over which he assumed command upon its launch in 1843. 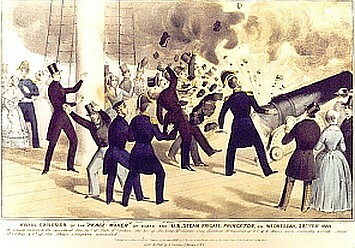 In February 1844, during visit of President Tyler and some 200 dignitaries to ship, one of its two main guns, named the "Peace-Maker," exploded during firing demonstration, killing six, including Secretary of State, Secretary of Navy and two Congressmen, and injuring Stockton and 19 others, with subsequent court of inquiry absolving Stockton of any responsibility for accident. During administration of President James K. Polk, sent by President to sail on Princeton to convey offer of US annexation to Republic of Texas, gained useful intelligence on tensions which later led to Mexican-American War. In summer 1846, arrived in California to assume command of US naval forces in Pacific, launched assault on Mexican forces at Los Angeles which led to their abandonment of position and US control of southern California with Stockton dispatching frontiersman Kit Carson as courier to inform President of conquest of California. As senior military authority, named military governor of California territory, subsequently succeeded by John C. Fremont. Resigned from Navy in May 1850 and in 1851 elected as Democrat to US Senate. As Senator, sponsored bill to abolish flogging as a Navy punishment. Resigned in January 1853 to serve as president of the Joint Companies, which had been formed in 1831 through merger of Delaware and Raritan Canal and Camden and Amboy Railroad and had significant, sometimes corrupt, influence in New Jersey government and politics. Delegate to unsuccessful Peace Conference of 1861 convened after Lincoln's election that attempted to prevent secession; in 1863, appointed to command New Jersey militia after Robert E. Lee invaded Pennsylvania. While still heading Joint Companies, died at Princeton and buried in Princeton Cemetery. Son John Stockton also served as US Senator 1865-1866 and 1869-1875 and as New Jersey Attorney General 1877-1897. Four US Navy ships named USS Stockton in his honor, as well as borough of Stockton in Hunterdon County, and Stockton, California, Stockton, Missouri and Fort Stockton, Texas, and Fort Stockton in San Diego. 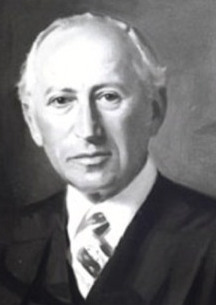 Chief Justice of New Jersey Supreme Court from its creation in 1948 until death in 1957, first to serve under new constitution of 1947, of which he was a leading advocate, reforming state judiciary under leadership and administrative control of chief justice. Nationally known as attorney, legal educator and judicial reformer, president of American Bar Association 1937-1938; chairman of New Jersey Judicial Council 1930-1947; Dean of New York University Law School 1943-1948. Helped draft 1939 federal legislation establishing US Administrative Office of the Courts, first unit within judiciary for improving management efficiency of cases and personnel; Federal Rules of Criminal Procedure to simplify and standardize handling of criminal cases; and Uniform Code of Military Justice after World War II. While chief justice, founded Institute of Judicial Administration to promote judicial reform nationally, remained its president until his death. Born in Newark, graduate of Newark (now Barringer) High School, took year off to work on railroad to earn money to attend Wesleyan University, where elected student body president and named to Phi Beta Kappa while completing work for both B.A. and M.A. degrees in four years, then graduated from Columbia Law School while also teaching at night in Newark high school. After admission to bar in 1913, practiced in Newark, clients included banks, insurance companies, governments, also represented civil rights clients including Socialist leader and presidential candidate Norman Thomas in free speech case against Democratic Hudson County boss Frank Hague. While continuing in private practice, in 1914 began teaching part-time at New York University Law School, professor 1918-1943 and Dean 1943-48. 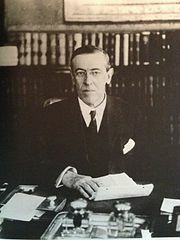 During 1930s one of most active trial and appellate lawyers in country, between 1928 and 1932 won all 21 cases before New Jersey Court of Errors and Appeals, then state's highest court. In 1938, appointed by Delaware court as a director of Pepsi-Cola Co. to resolve proxy contest between competing shareholder factions, later served as board chairman and counsel to company until appointment as judge in 1947. 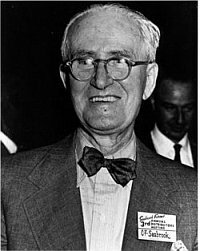 Powerful Republican leader of reform movement in Essex County, endorsed Alfred Driscoll for governor in 1947 after receiving commitment of Driscoll to support new constitution, nominated by Driscoll after election as chief justice of newly-formed Supreme Court. Delegate to 1936, 1940 and 1944 Republican National Conventions. After appointment as Chief Justice, authored controversial decision in case of Winberry v. Salisbury holding that Supreme Court control of rules of judicial procedure not subject to override by legislature. Declined to be considered on two separate occasions for nominations to US Supreme Court, but mentor to William J. Brennan, Jr., when Brennan a justice on state Supreme Court and played key role in 1956 nomination of Brennan, a Democrat, by Republican President Dwight D. Eisenhower to US Supreme Court. Awards included 32 honorary degrees and American Bar Association Gold Medal, building at New York University Law School also named in his honor. One of greatest jazz singers and pianists. Born in Newark, took piano and organ lessons at age seven, by age twelve started singing in choir and playing organ at Mount Zion Baptist Church. Launched jazz career at Harlem's Apollo Theater amateur-night contest in 1943, won $10 and week as opening act at Apollo for Ella Fitzgerald. Later toured country with bands led by Earl Hines and Billy Eckstine before starting solo career in clubs, on television and through recordings. Dubbed by Chicago disc jockey Dave Garroway, later long-time host of "Today" show, as "the divine one," also nicknamed “Sassy.” Won Grammy Award for 1980 performance of Gershwin program with New Jersey Symphony broadcast on PBS. Received 1989 Grammy Lifetime Achievement Award as well as National Endowment for the Arts Jazz Masters Award, inducted into Jazz Hall of Fame shortly before her death at age 66 from cancer. After her death, singer Mel Torme declared, “She had the single best vocal instrument of any singer working in the popular field.” Buried at Glendale Cemetery in Bloomfield. Mathematician whose work had diverse applications in development of atomic bomb, evolution of computers, wireless communications, climate analysis and game theory. Born and educated in Hungary, at age 22 received both Ph.D. in mathematics from Pázmány Peter University in Budapest and diploma in chemical engineering from the ETH Zurich in Switzerland. Emigrated to US in 1930, first as visiting professor at Princeton University, joined faculty of Institute for Advanced Study in Princeton in 1933, became naturalized citizen in 1937. During World War II worked on Manhattan Project in New Mexico to develop atomic bomb. Principal contribution to atomic bomb concept and design of explosive lenses needed to compress plutonium core of Trinity test device. In computing, first to demonstrate that program instructions could be stored in computer's memory instead of on external panels or punch cards. In 1955, appointed by President Eisenhower to Atomic Energy Commission, and in 1956 received its Enrico Fermi Award. Published 150 papers; 60 in pure mathematics, 20 in physics, and 60 in applied mathematics. Died in Washington of cancer at age 53. Daughter Marina von Neumann Whitman professor at University of Michigan, former vice president and chief economist at General Motors. Awarded Nobel Prize in 1952 for discovery of antibiotic streptomycin, first to cure tuberculosis, directed team of researchers at Rutgers that discovered range of antibiotics (a word he coined) to treat infectious diseases. Born in Ukraine, emigrated to US in 1910, moved in with cousin who had small truck farm in Metuchen with a poultry plant, spent first few months on farm, learning animal nutrition and germination of seeds. .Graduated from Rutgers College in 1915 with bachelor of science degree in agriculture, awarded Master of Science following year after doing research at New Jersey Agricultural Experiment Station at Rutgers in soil bacteriology. Appointed as Research Fellow at University of California, Berkeley, where awarded Doctorate of Philosophy in biochemistry in 1918. Returned to Rutgers to join faculty as lecturer in Soil Microbiology and Microbiologist at Agricultural Station. Research focused on analyzing soil to discover bacteria, entered agreement with Merck pharmaceutical company through which it provided funds, chemical assistance, experimental animals for pharmacological evaluation of antibiotics, and large-scale equipment in return for assignment of any patents resulting from research Rutgers Foundation a small royalty. In addition to streptomycin, Waksman's Rutgers team discovered actinomycin, clavacin, streptothricin,, grisein, neomycin, fradicin, candicidin, candidin and others. 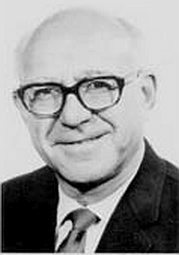 Dedicated half of royalties to support establishment of Institute of Microbiology, which opened in 1954 with Waksman named first director and was renamed after him following his death in 1973. National Academy of Sciences gives in his honor Selman A. Waksman Award in Microbiology; in 1985 American Chemical Society designated research on antibiotics at Rutgers by Waksman as National Historic Chemical Landmark. Author or co-author of over 28 books and 400 scientific papers. Served 16 years as Chief Justice of New Jersey Supreme Court after appointment in 1957 by Governor Robert Meyner, for whom he previously served as counsel to governor. Best known for landmark 1973 decision of Robinson v. Cahill, which held that state's reliance on property tax as primary revenue source for funding public schools violated responsibility under state constitution to provide "thorough and efficient" education for students in poorest districts. Court under his leadership became nationally known for decisions advancing consumer protection; tenant rights; and land-use, such as key decision in Mount Laurel case holding that municipalities could not use planning and zoning powers to exclude development of affordable housing. Prominent critic of expansive view of rights of criminal defendants advanced by US Supreme Court under Chief Justice Earl Warren, particularly exclusionary rule suppressing evidence obtained by illegal searches and seizures. Born in Newark, at age five, father died, mother supported family through earnings from job at produce store. Graduated 1924 from Newark's Barringer High School, classmates included William Brennan, future justice of supreme courts of both New Jersey and United States. With financial support from family friends, attended Cornell and its Law School, graduated at top of class and president of its law review. During World War II, served in Judge Advocate General's Corps in Army. Became partner in Newark firm of McGlynn, Weintraub and Stein, practiced until appointment as judge. Lifelong mentor of Brendan Byrne, hired Byrne at law firm while still Harvard Law student, also as assistant counsel when counsel to Governor Meyner, remained close adviser after retirement as chief justice in September 1973 and Byrne's November 1973 election as governor. ﻿Hollywood "superagent" whose clients included Ronald Reagan, Frank Sinatra, Johnny Carson, Bob Hope and Elizabeth Taylor, also helped to develop Ed Sullivan and Jackie Gleason television shows, later career in sports as president of New York Jets and first chairman of New Jersey Sports and Exposition Authority during construction of Meadowlands sports complex. Born in Brooklyn, father owned paper bag manufacturer. Graduated from Rutgers University in 1931, football career ended by injury in freshman year. After working briefly as copy boy for New York Times, in 1932 hired at Music Corporation of America talent management agency, credited with introducing practice of packaging clients together to fill casts in movies and television and in support roles like directing and writing. In 1938, married Leah Ray Hubbard, singer in band led by Phil Harris. Later named president of MCA television unit, grew to become dominant producer of popular shows including "Wagon Train, "My Three Sons," "Bachelor Father" and "The Virginian." Other investments included Monmouth Park Racetrack with partners including Leon Hess petroleum magnate and David Wilentz, former New Jersey Attorney General and powerful lawyer and Democratic political activist, also with wife owned, bred race horses through stable Elberon Farm. In 1963, with Hess and other partners, bought struggling New York Titans of American Football League for assumption of team's $1 million in debt, changed team's name to Jets and uniform color to green in recognition of his birth on St. Patrick's Day. Resigned from MCA in 1965 and named Jets president, gained wide publicity for signing for $400,000 University of Alabama quarterback Joe Namath, deal later cited as building stature of American Football League, along with 1968 Jets Superbowl III win led by Namath, contributing to merger of AFL and NFL. Prior to 1968 season, bought out by other partners and fired as Jets president, purportedly for dominating media coverage of team's success. Recruited by New Jersey Governor William Cahill to head newly-created New Jersey Sports and Exposition Authority, negotiated agreement with NFL's New York Giants to relocate to new Meadowlands stadium, oversaw its construction and that of adjacent race track completed in 1976. 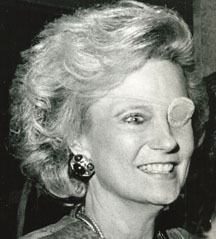 Named president in 1977 of Madison Square Garden, continued into 1980s. Major benefactor and fundraiser for Rutgers, served as Rutgers trustee and board member, with wife established David and Leah Ray Werblin Foundation to provide financial support, Rutgers named in his honor Sonny Werblin Recreation Center for water sports and indoor training facilities. Physician trained as pharmacist who settled in Millville in 1883. In 1888 bought controlling interest in small factory making glassware used by pharmacists, including laboratory vials, which became T.C. Wheaton Co. Products soon marketed to scientific laboratories, chemists, perfumers, and physicians, gave up medical practice to run business full-time in 1890. Bought 25 square blocks in Millville for expansion, at peak 41 factories throughout US and subsidiaries in 20 other countries. After death in 1931, son Frank and grandson Frank Jr. successively ran company. With introduction of plastics in 1950s, developed and built world's first commercial injection blow molding machine for plastic, expanding markets in cosmetics and pharmaceutical packaging. Remained in family control until sale in 1996, now known as Wheaton Industries. Grandson founded in 1968 Wheaton Village (now Wheaton Arts and Cultural Center), non-profit living museum and artisan colony in Millville, features demonstrations and exhibits of glassmaking. Vintage bottles, several with silhouettes of historic figures or symbols, remain valued collectibles. Along with Frederick Coville, chief botanist of US Department of Agriculture and first director of National Arboretum, developed nation’s first cultivated blueberry, foundation of commercial blueberry industry. Daughter of head of family cranberry business, J.J. White, Inc. on 600-acre cranberry farm in Whitesbog in Pine Barrens. After reading article by Colville on blueberry propagation, in 1911 invited him to come to farm to continue research, helped locate wild blueberry bushes with desired traits; asked woodsmen about berry size, resistance to cold and disease, flavor and time of ripening. Coville cross-fertilized bushes by hand to create new berry varieties. By 1916, White and Colville had created first commercial crop of blueberries, in 2014 New Jersey ranked fifth of states (Georgia #1) with $79.5 million in blueberry production. White helped organize New Jersey Blueberry Cooperative Association in 1927, also pioneered use of cellophane in packaging blueberries. First woman member of American Cranberry Association. Also active in promoting native American holly, formed Holly Haven, Inc. and helped found in 1947 Holly Society of America. Famed poet, born on Long Island and raised in Brooklyn, father a carpenter and farmer. Attended public schools in Brooklyn until age 11, but largely self-educated through frequent visits to libraries and museums. Worked first as office boy for prominent Brooklyn lawyers. In 1831, became apprentice on Long Island Patriot, liberal, working-class newspaper, at age 12 had first article published. By 16, a journeyman printer and typesetter in Manhattan. 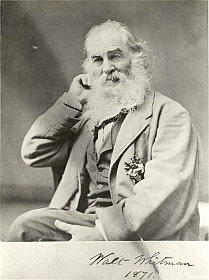 Teacher for five years in ten different Long Island towns, rooming in homes of his students, also began writing poems. In 1838, founded own newspaper on Long Island, but it failed within year. Began submitting freelance fiction stories to literary magazines, in 1842 first and only novel published in special issue of magazine on temperance theme of evil acts from drinking. Served as editor of Brooklyn Eagle newspaper 1846-1848, but fired by publisher over repeated editorials against slavery. Leaves of Grass, book of 12 untitled free verse poems, first published in 1855 with Whitman paying for run of 795 copies, designing cover and doing some of typesetting himself, praised by Ralph Waldo Emerson but rejected by most critics for lack of rhyme and "vulgar" sexual language and sold poorly. Published second expanded edition in next year with additional poems and titles to originals, but still failed to sell run of 1,000 copies. In 1860, a new publishing house in Boston published another edition of Leaves of Grass, which received generally positive reviews, sold relatively well and boosted reputation in literary circles. During Civil War, moved to care for brother, who had been slightly wounded at Battle of Fredericksburg, and volunteered to care for wounded at field hospitals and later in hospitals in Washington while also working part-time in Army paymaster office and subsequently in bureau handling Indian affairs in Department of Interior. After Lincoln's assassination, wrote elegies to him "When Lilacs Last in the Dooryard Bloom'd" and "O Captain! My Captain!," subsequently published in Drum-Taps and Sequel collection of prior poems written during War. In 1873, suffered stroke which partially paralyzed left side, traveled to Camden to visit ill mother, who died three days after arrival. Following brief return to Washington, moved to Camden, living first for ten years with brother and wife, later in 1884 buying own home for $1,750. Published extensively while in Camden, including expanded 1882 edition of Leaves of Grass with over 300 poems compared to 12 in original book, also gave paid lectures on Lincoln's life with recitations of poems such as "O Captain! My Captain!" Died at age 72 in Camden home of tuberculosis and buried in city's Harleigh Cemetery, home open to public as historic site Walt Whitman House. President of United States 1913-1921 and governor of New Jersey 1911-1913, only New Jersey resident to be elected president. 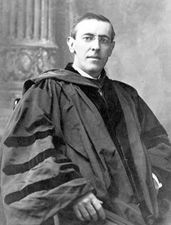 Born Thomas Woodrow Wilson in Staunton, Virginia, of Scots-Irish descent, son of a Presbyterian minister who during Civil War was pastor in Augusta, Georgia and briefly a chaplain for Confederate Army, and after end of War a professor in Columbia, South Carolina, at Columbia Theological Seminary. Father a slave owner who defended slavery, although his father had previously published anti-slavery newspaper in Ohio. As boy, had learning disability (possibly dyslexia) but taught himself shorthand and with aid of father improved through home study. Enrolled at Davidson College in 1883 while father was on faculty, but upon father's obtaining teaching position at College of New Jersey (renamed Princeton University in 1896)transferred there, graduating in class of 1879 after being active in debating and literary society. Returned to Virginia to enroll at University of Virginia Law School, after first year continued study under Georgia lawyer and admitted to bar. After practicing for year, enrolled in 1883 at Johns Hopkins University to study history, political science and German language, earned doctorate 1886 in political science. First book Congressional Government, based on dissertation arguing for advantages of parliamentary system over US separation of executive and legislature, published in 1885, same year as marriage to a minister's daughter, Ellen Louise Axson. After teaching at Cornell, Bryn Mawr and Wesleyan, in 1890 appointed Chair of Jurisprudence and Political Economy at Princeton, concurrently lectured at New York Law School. At Democratic National Convention, frontrunner House Speaker Champ Clark failed to secure nomination on first ballots, led to deadlock with votes split among Clark, Wilson, Ohio Governor Judson Harmon and Alabama Congressman Oscar Underwood. On 46th ballot, Wilson nominated after William Jennings Bryan--Democratic nominee in 1896, 1900 and 1908--announced support for him. 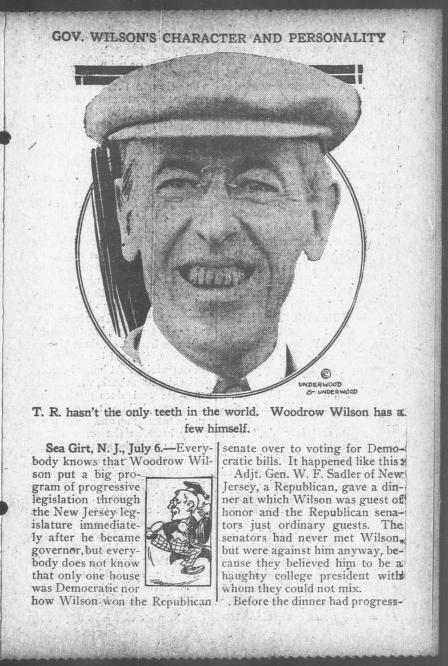 Wilson general election campaign aided by split among Republicans, with President William Howard Taft nominated to run for re-election and former President Theodore Roosevelt running independent campaign as nominee of Progressive, or "Bull Moose," Party. In three-way election, Wilson received only 42% of popular vote but large margin in Electoral College with 435 votes to 88 for Roosevelt and only eight for Taft. Resigned as governor shortly before inauguration, in first term successfully pushed for lower tariff through Underwood Act which included graduated federal income tax; regulation of financial markets through Federal Reserve Act; creation of Federal Trade Commission to prohibit unfair business practices; prohibition of child labor and restriction of work days to eight hours for railroad workers. In August 1914, wife Ellen died of kidney disease in White House; in December of following year, married Edith Bolling Galt, a widow and Virginia native who had been introduced to him by his cousin, Helen Bones, who had served as official White House hostess since death of Ellen Wilson. In first term, resisted calls to enter war in Europe, narrowly re-elected in 1916 with supporters claiming "he kept us out of war." Won re-election by nearly 600,000 votes over Republican, former Supreme Court Justice Charles Evans Hughes, but only 277-254 margin in Electoral College. Wilson's re-election marked the first time that a Democratic Party candidate had won two consecutive Presidential elections since Andrew Jackson won re-election in the 1832 election. But soon after inauguration to second term, asked Congress on April 2,1917, for declaration of war against Germany, citing German provocations in attacks on shipping and refusal to respect US neutrality. War mobilization included major projects in New Jersey such as construction of Camp Dix and Camp Merritt as principal Army training and embarkation centers. Enacted series of measures to restrict dissent, including Espionage Act of 1917 and Sedition Act of 1918, with passage aided over fear of worldwide Marxist movement following 1917 Bolshevik Revolution in Russia. In 1918, reversed prior opposition to federal constitutional amendment guaranteeing national right to women's suffrage and supporting action at state level, endorsed constitutional amendment approved in 1920 over Southern opposition. During war, advanced his "Fourteen Points" proposal for international organization to help avoid future conflicts, and in 1919 traveled to Paris to negotiate Treaty of Versailles ending war and including creation of League of Nations. Upon return from Europe, embarked on national train tour to build support for ratification of Treaty, collapsed while in Colorado and suffered stroke upon hurried return to White House on October 2, 1919, which partially paralyzed left side and impaired vision. Effects of stroke hidden by wife and doctors from Congress and public, with wife reportedly covertly making major decisions in his behalf. Treaty of Versailles failed to be ratified in Senate by seven votes. Never fully recovered from stroke, left office in 1921 and died at age 67 in Washington, buried in National Cathedral. Subject of increasing criticism for racist views and actions, such as resisting admission of blacks to Princeton; allowing previously desegregated federal agencies to bar blacks from employment; and comments in writings citing benefits of segregation. Princeton University named in his honor Woodrow Wilson School of Public and International Affairs and Wilson College, one of its five residential colleges; other legacies include Woodrow Wilson International Center for Scholars, policy forum established in 1968 by Congress as part of Smithsonian Institution; Woodrow Wilson Bridge across Potomac River in Washington; and Avenue du President Wilson in Paris. Scotsman and prominent Presbyterian minister and theologian who was recruited to emigrate to America in 1768 to accept appointment as sixth president of College of New Jersey (later Princeton University), subsequently signer of Declaration of Independence. After arrival in Princeton, transformed college founded primarily to train clergymen into school with broader curriculum modeled on schools he had attended, University of Edinburgh and University of Saint Andrews. Traveled throughout colonies to raise funds and recruit students, persuaded George Washington to donate 50 guineas and convinced parents of James Madison to enroll him in Class of 1771. First to use term "campus" in description of a college in referring to pastoral site in Princeton. Also became advocate of independence, joined Committee of Correspondence and Safety in early 1774 formed after backlash to British tax measures imposed on colonies. May 1776 sermon "The Dominion of Providence over the Passions of Men" widely published as tract supporting independence, elected as New Jersey delegate to Continental Congress, appointed Congressional Chaplain by Congress President John Hancock. During debate, responded to concerns that country not ready for independence by saying it "was not only ripe for the measure, but in danger of rotting for the want of it." Served in Congress from June 1776 until November 1782, member of over 100 committees, most notably board of war and committee on secret correspondence or foreign affairs; helped draft Articles of Confederation. Closed College of New Jersey and evacuated students in November 1778 as British forces occupied town, after British retreated used personal funds to help repair damage to College's main building Nassau Hall and resume classes. Hosted 1783 ceremony at Nassau Hall at which Congress thanked George Washington for War service, with Washington also attending commencement for Class of 1783. Also served term in New Jersey legislature, spoke in support of ratification of US Constitution. Following death in 1794, son-in-law Samuel Stanhope Smith succeeded him as president of College of New Jersey. Buried in Princeton Cemetery, Witherspoon Hall at University, local street and public school bear his name. So-called "Al Capone of New Jersey," Newark-based gangster and bootlegger from early 1920s Prohibition years until controversial death by hanging in 1959 in basement of West Orange home. Born in Newark to Jewish immigrants from Russia, quit school at age 14 to support family after father's death in 1918, first selling produce from pushcarts and later by selling lottery tickets through local stores. Reached six feet tall in teens, led to nickname "Long" and later "Longie." With start of Prohibition, became a leading bootlegger in smuggling whiskey from Canada, also expanded into gambling, extortion, labor racketeering, as well as owning several businesses such as a supplying vending machines and juke boxes, operating nightclubs and restaurants and marketing "Muzak" piped-in music for elevators, stores and factories. Also exercised influence in Newark as political boss of primarily Jewish Third Ward in rivalry with Ruggiero "Richie the Boot" Boiardo, boss of Italian First Ward, after initial clashes reached compromise agreement to maintain criminal operations in respective neighborhoods. By late 1920s, annual income estimated at $2 million, also attempted to build public image as legitimate businessman, offered reward for safe return of Lindbergh baby in 1932 (perhaps to end intense dragnet of police highway stops which might inadvertently catch his trucks transporting bootleg whiskey), and contributed to charities, including $250,000 to a Newark slum-clearing project. 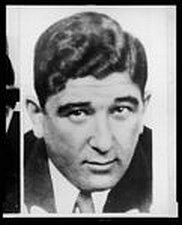 In 1929, participated in both Cleveland Conference, one of first meetings between Jewish and Italian organized crime leaders, and Atlantic City Conference hosted by Nucky Johnson whose attendees included Al Capone, Meyer Lansky and Lucky Luciano resulting in eventual formation of National Crime Syndicate. Dated movie star Jean Harlow, reportedly loaned money to Harry Cohn, head of Columbia Pictures, in return for Harlow starring in two movies, also bought Harlow jeweled bracelet and Cadillac. After Dutch Schultz's murder at Newark steak house in 1935, took over Schultz's criminal operations and through 1940s controlled gambling in state along with associate Willie Morretti. Later married Mary Mendels Steinbach, only daughter of Eugene Mendels--a founder of what later became American Stock Exchange and former gangster--and divorced wife of son of founder of successful Steinbach department store originally opened in Asbury Park in late 19th century. Following investigation of tax returns, subpoenaed to testify in 1959 McClellan Senate Committee hearings on organized crime, but shortly before scheduled appearance, found hanged in basement of his West Orange home. Essex County prosecutor and later governor Brendan Byrne confirmed medical examiner's finding that death a suicide, but questions continued over reports that police found bruises on wrists, suggesting being bound before hanging staged as suicide. Speculation that death ordered by either or both Vito Genovese or Meyer Lansky, fearing that Zwillman had become government informant and would provide damaging testimony before McClellan Committee.